Afghan forces have been battling Taliban fighters to retake the city of Kunduz, a day after it fell to the insurgents in their biggest victory since their removal from power in 2001. Heavy fighting has been reported, and President Ashraf Ghani said his forces had regained some government buildings. Police said more than 80 militants had been killed, although there is no independent confirmation of this. 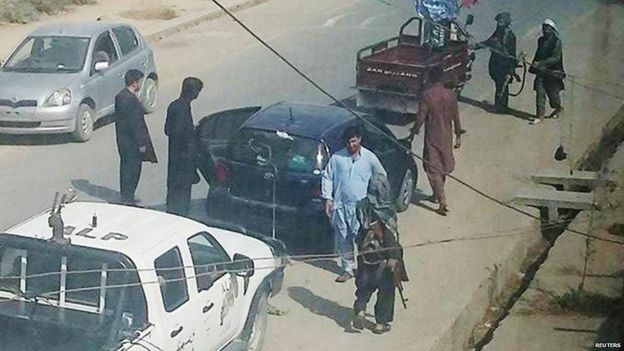 The Taliban overran Kunduz on Monday, forcing government troops to retreat. US military planes were supporting the Afghan operation, striking Taliban positions on the outskirts of the city, a Nato spokesman said. A Pentagon spokesman said the US had faith the Afghan military would recapture the city. The Afghan health ministry said Kunduz hospitals had received 16 bodies, with almost 200 people injured. Medical charity Medecins Sans Frontieres‎ said its hospital in the city had been overwhelmed, with scores of patients suffering gunshot wounds. The US Army confirmed that American and Nato military advisers, including special forces, were in the area, but denied they were fighting on the ground. "But these are dangerous situations and if they need to defend themselves, they will," said a spokesman. Kunduz is the first provincial capital seized by the Taliban since they lost power in the US-led invasion 14 years ago. An eyewitness in Kunduz told the BBC that Taliban reinforcements arrived on Tuesday, with the situation too dangerous for locals to leave. The Taliban's new leader, Mullah Akhtar Mansour, said the government should admit defeat. Kunduz residents "should not be worried about their lives and property" and should "continue as normal", he said in a statement. But the eyewitness said that while some locals had welcomed the Taliban, "most people are out there (on the streets) out of fear, and not out of sympathy". The surprise attack on the key northern city came as President Ghani completed his first year in office. In a televised address on Tuesday, he said "progress" was being made recapturing Kunduz, but security forces had been hampered by the Taliban using civilians as human shields. "The government of Afghanistan is a responsible government and it cannot bomb its people and compatriots inside the city and will not do so," he said. The seizure of Kunduz has huge propaganda value for the insurgents. Pictures of Taliban fighters hoisting their trademark white flags in the city's squares and main buildings have been circulating on social media. The capture of one of the most strategic and richest cities of Afghanistan will not only cement the credentials of the new Taliban leader, Mullah Akhtar Mansour - it will also embolden the Taliban in general. The Taliban's main challenge will now be to hold the city. The way the Taliban behave and govern the city, even if it is for a few days, will demonstrate how far the group has changed since the fall of their regime in 2001. Meanwhile, they will also try to expand their control in the neighbouring provinces where they already control huge chunks of territory. Nato ended its combat mission in Afghanistan in December, withdrawing most of its troops apart from a 13,000-strong residual force used for training and counter-terrorism operations. Kunduz is strategically important as a transport hub for the north of the country. The insurgent attack began at dawn on Monday as fighters fell upon the city from different directions. They captured key buildings and freed about 500 prisoners, including members of the Taliban, from the jail. Officials and troops retreated to the airport, though dozens of civilians who fled to the airport were reportedly turned away by security forces. Militant violence has increased across Afghanistan since the departure of most US and Nato forces last year.